My name is Alejandra (Ale), Mother NaturAle. I have an undeniable passion for conscious pregnancy, natural childbirth, connected parenting, & healthy natural living. Becoming a mother has been one of the most sacred and profound transformations I’ve experienced and I have found my purpose in guiding & holding space for other families in their own journey to parenthood. My intention is to support & nourish your transformation into a family. Respecting and honoring your unique & sacred transition is my goal. My hope is that as expecting parents, you take this opportunity to develop a deep connection with your baby, with yourselves and strengthen the bond between each other. Setting down strong roots that will grow your family tree! 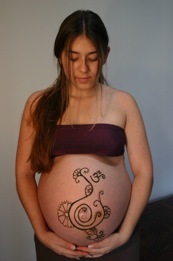 I believe pregnancy is a magical and powerful experience where we bloom. I also believe as every woman deserves the opportunity to experience birth as a meaningful & powerful rite of passage to birth her child with awareness and beauty. I want to help you create a safe & loving environment for you to connect with and open to your own Mother Nature. I offer a variety of services for your growing needs. Click on the links below to learn more about my services and what I can do to assit you on this wonderful journey to motherhood. I was born and raised in Bogota, Colombia, moved to FL in 2000. I am married to an amazing man and together we parent four beings of light who I attribute for my fascination with pregnancy, birth, and connected parenting. Soon after the birth of my first son in 2004, I realized I wanted to be part of other women’s journey to motherhood. I had a wonderful unmedicated natural birth at the hospital attended by a midwife and with the support of a doula. It was a transcendental experience that changed me. I went in as a woman and rebirth myself into a mother. A couple years after, I found myself assisting my own midwife and her colleague at a local birth center where I had the exciting opportunity to witness many beautiful, natural births and built my skills in the supporting role during childbirth. One of my favorite parts of doing this work, was and continues to be, witnessing the sweet moments immediately after birth when a mother nurses her child for the first time. Having successfully breastfed my own baby, I quickly found myself assisting and supporting mothers through this tender stage of the postpartum period. In 2007, I began working as a Peer Counselor for the Orange County Health Department. In 2008, I became a CLC (Certified Lactation Counselor) and in 2011 an IBCLC (International Board Certified Lactation Consultant). In 2009, I gave birth to my second son at home in the water surrounded and supported by my musically talented husband, my firstborn (who was four years old at the time), and my two best friends (who happen to be midwives!). We chanted and danced to the beat of the drums as the sun rose, it was such a delicious experience! I then felt inspired to help create and hold that sacred space for other mothers! In 2010, I became a Certified Doula through DONA International. In 2012, I became Water Birth Certified by Waterbirth International. In 2013, I became a Sacred Pregnancy Instructor as well as an Artist of Sacred Postpartum Mother Roasting, and a Certified Neonatal Resuscitation Provider through the American Academy of Pediatrics. In March 2014, I free-birthed my third son at home into my husband’s hands! It was much more work than my previous birth experiences but epic nonetheless! This chunky monkey was 9 Lbs 14 oz!!!! In March 2016, we welcomed another beautiful boy into our family. Born in our bathtub, into my hands and in the presence of his biggest brothers and some of our wonderful friends. It was super sweet! Today I continue riding the challenging and gratifying journey of motherhood and truly enjoy supporting other women in their own transformations.